Life is a canvas and we are the artists, with each day offering us a blank canvas on which to create something beautiful. Yet sometimes, between the texting and to-dos, it's hard to feel inspired or creative. Inkspirations for a Happy Heart shares more than 30 soul-stirring original designs, plus motivating mantras to help you relax, unwind, and greet each day with renewed optimism and creative energy. Whether you're new to coloring or you're a gel-pen aficionado, you may have already admired the artistic creations of Diane Yi whose stunning artwork has been shared, pinned, or colored around the world. With Diane's signature style of intricate details with exquisite flourishes, Inkspirations for a Happy Heart provides a perfect canvas that will inspire you to color your own world a little brighter. Life is a canvas and we are the artists, with each day offering us a chance to create something beautiful. Yet some-times, between the texting and to-dos, it's hard to feel inspired. 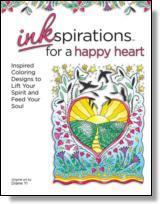 Inkspirations for a Happy Heart shares more than thirty soul-stirring, original designs plus motivating quotes to help you greet each day with renewed optimism and creative energy. Throughout the book you'll find a mix of designs: easier pages that can be completed in a shorter amount of time; more detailed pages with intricate elements; and nature scenes that feature calming elements and less detailed work. If you want to do more than color, we have also hidden some hearts in the artwork for you to find. Through this, we hope to inspire you to be on the lookout for more 'heart moments,' or things that lift your spirit, in your daily life. Happy coloring! Coloring is supposed to be a stress-free, no-worries kind of activity. There really is no right or wrong way to do it. But for anyone who wants to take it to the next level and make each page pop, here are some tips. Stippling—Stippling is a good way to add texture to your art. Stippling means to place many tiny dots on the surface. Your dots can be close together or far apart, depending upon the effect you are trying to create (you can stipple trees, water, flowers, or the sky—anything really!). Hatching—Hatching is when you draw a series of parallel lines in the same direction. Cross-hatching—As the name implies, cross-hatching means that you draw a series of parallel lines (hatching) and then you make another set of parallel lines going in another direction on top of the first set of lines. This creates both shading and texture. Blending Colors—By blending several colors together, you can create a three-dimensional shading effect. For example, if you want to color a leaf green, use the color wheel on the next page to choose several shades of green as well as some colors next to the green (yellows and blues). Try to envision where the light would be falling on your image. Wherever the light would fall on the leaf is where you will place your lightest colors (the lighter greens and yellow). Wherever the shadow would fall is where you would place your darker colors (the darker green and a bit of blue). By overlapping the colors and blending them, you will create a realistic effect. It helps to practice on a piece of scrap paper first, and to work slowly to see if you are creating the effect you wish before you complete a large area. ©2016 HCI Books. All rights reserved. Reprinted from Inkspirations for a Happy Heart: Inspired Coloring Designs to Lift Your Spirit and Feed Your Soul. No part of this publication may be reproduced, stored in a retrieval system or transmitted in any form or by any means, without the written permission of the publisher. Publisher: Health Communications, Inc., 3201 SW 15th Street, Deerfield Beach, FL 33442.